Tim Miller Associates, Inc. (TMA) is taking an active role in assisting our clients in tackling the proposed updates to New York State’s environmental review regulations, known as the State Environmental Quality Review Act (SEQRA). 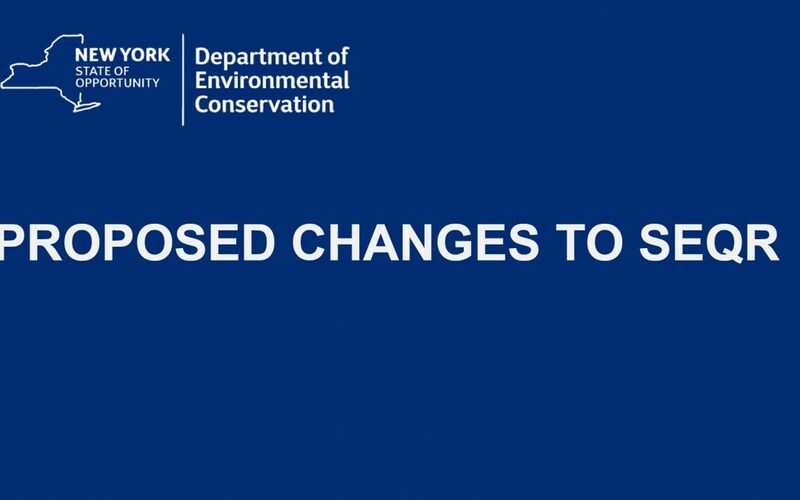 The New York State Department of Environmental Conservation (DEC) recently published its proposed amendments to the SEQRA regulations which are intended to streamline the review process without sacrificing meaningful environmental analysis. As part of the update process, DEC has prepared a generic environmental impact statement (GEIS) to discuss the goals and rationale for the proposed amendments and to provide an opportunity for public input. TMA will be looking to submit our comments on the amendments, which the DEC has invited through May 19, 2017. • Clarification of the process for lead agencies to determine the adequacy of a Draft EIS. Please consult us if you have questions on the effects of the new regulations on your project. As our current clients know, Tim Miller Associates, Inc. is ready to assist with professional expertise in the SEQRA and permitting process to make projects happen. Tim Miller Associates, Inc., is a full service planning consulting firm that has served the New York Metro / Hudson Valley Region for over 30 years. We provide land planning and environmental services to developers, corporations, municipalities and community planning associations. Our experienced staff are recognized experts in the areas of land use planning, zoning, development feasibility studies, environmental impact assessments, as well as the technical studies that are required by the regulatory agencies to effectuate development, including traffic analysis, wetland delineation, visual analysis, groundwater and geotechnical studies, air quality and noise studies, archaeological surveys, landscape design and impact mitigation plans.